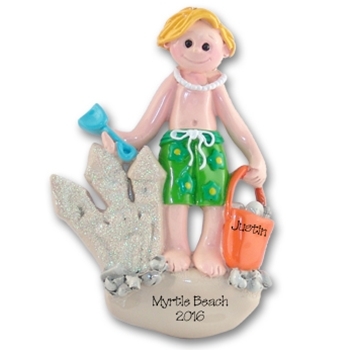 From Deb's "Giggle Gang" collection, this darling little boy is having a wonderful time at the beach. With pail and shovel in hand, he is building a sand castle. This ornament is wonderfully detailed with suburn, real sand and sea shells. It may be easily personalized with a name and year. Designed by Debi Allison, it is made from resin and hand painted. Comes complete with satin ribbon and hook for hanging. Measures approximately 4¾" H x 4" W and is without pillow box.